The Annual General Meeting of the Friends will be held on Thursday 7 July 2005 in the National Library auditorium. It will be followed by a Special General Meeting to vote on changes to the Society’s constitution proposed by Trevor Mowbray at the 2004 AGM. The official announcement of these meetings follows. The evening will begin in the traditional way with drinks, nibbles and chat. The meetings will begin at 6pm and will include the election of officers. Our President, Julie Eberly, has resigned from the position. We thank Julie for her contribution and wish her well with her new endeavours. We are fortunate that Emma Macdonald is prepared to take on this role for 2005-2006. If you are interested in being on the committee, or have any issues you would like to have included on the agenda please let Kerry Fryer know by1 July 2005 Kerry.Fryer@wcc.govt.nz or phone 477 6152). It is also time for subscriptions to be renewed. The 2004 Annual General Meeting agreed to hold the subscription rate at $20 a year. A copy of the membership form is on the last page of this newsletter. You may also like to make a contribution to the Scholarship fund so we can continue and / or increase the amount we are able to offer a student doing research based on the DNW Collection. A separate line has been included on the form for those Friends who would like to make such a donation. We will be very happy to accept your payment at the AGM or post it to the address given on the form. The meetings will be just the beginning of what promises to be a very special occasion and details of the rest of the evening’s activities can be found on page 3 and on the enclosed flyer. We really hope there will be a big crowd – so do bring your friends! This SGM will immediately follow the conclusion of the Annual General Meeting to be held in the Conference Room on the Lower Ground Floor of the National Library of New Zealand, Molesworth Street, Wellington at 6pm. The SGM is to consider and vote upon proposed changes to the Society’s constitution. 3) sponsor publications such as a catalogue of the collection, a register of collections and collectors, or papers on aspects of publishing for children, particularly from a historical perspective. #15. The Collection 1) The Collection known as the Dorothy Neal White Collection is and remains the property of the National Library of New Zealand. 2) Any donations of library material to the Society shall become part of the Collection. 3) sponsor publications such as a catalogue of the collections, a register of collections and collectors, or papers on aspects of publishing for children, particularly from an historical perspective. The name of the Society will remain the same, namely “The Society of the Friends of the Dorothy Neal White Collection Incorporated”. At the time of the incorporation of the Society the Susan Price Collection (SPC) had not been gifted to the National Library and the National Children’s Collection (NCC) was still the Head Office Collection of the School Library Service. Since then Susan has made her generous gift to the Library. When the Dorothy Neal White Collection was originally formed it was envisaged that periodically it would absorb a decade of books from the NCC. Decisions made when formulating The National Library of New Zealand Collections Policy (1996) resulted in the NCC being reshaped to become a research collection of children’s literature. The imperative to transfer books was therefore nullified. Both the SPC and the NCC are collections that would attract and benefit from a group of supportive Friends. However, they are likely to draw upon the same relatively small group of people interested in children’s literature. The three collections have sufficient similarity and purpose to make one support group an elegant solution. One support group for all three collections is more likely to attract sufficient members to remain viable in the future. FROM THE RESEARCH LIBRARIANTours: I have been delighted to host several visiting groups. Incoming groups of Master of Library and Information Science students were given a very brief introduction to the children’s collections and I encouraged them to consider basing their research paper on the Dorothy Neal White Collection and mentioning that there is a scholarship. I reiterated this message when talking to students studying for the reference paper. Several Friends were among a group of Elsie J Oxenham enthusiasts who spent a happy morning among the stacks. Later in the year we will be publishing a Notes-Books-Authors about Elsie J Oxenham, written by Barbara Robertson. The Eastern suburbs Probus Group also visited. The award for the visitors who had travelled the furthest to see the collections must go to Colleen Yetter and her group of 14 students from Pacific Lutheran University, Tacoma, Washington, USA. They were very enthusiastic and Colleen returned for a further 2 hours in the afternoon. Eight National Library Reference Service staff thoroughly enjoyed their visit to see the Susan Price Collection. Researchers: Topics being researched by recent visitors to the collection have included imperialism and the portrayal of Germans in children’s books in the early part of the twentieth century and biographical information on New Zealand children’s authors and illustrators. Cataloguing:The Retro Team completed the online cataloguing of the National Children’s Collection. This was a huge task and I am very grateful for their efforts. It makes my reference work, checking of books offered on donation and ordering so much easier. And I am sure, now that the collection is “visible” to other libraries, that more of the books are going out on interlibrary loan. Display:There is a small display of illustrated editions of stories by Hans Christian Andersen in celebration of the 200th anniversary of his birth. Plus “The Story of Ferdinand” illustrated by Robert Lawson in celebration of the author, Munro Leaf’s, centenary. Staffing:Since 2002 Ruth Lightbourne has assisted clients in my absence. I am most appreciative of all the work Ruth did in this role while she was a member of the Music Room reference staff. Congratulations to Ruth on her recent appointment to the position of Curator, Special Printed Collections in the Alexander Turnbull Library. Linda McGregor from the Reference Service will now provide assistance to clients when I am away. I’m looking forward to working with Linda in the future. Caroline CampbellOn 10 March 2005 we held a Friends’ event with an Australian flavour. In a room decorated with gum leaves, yellow and green streamers, and an authentic ladies side saddle, Caroline Campbell, the 2004 Friends Scholarship holder, gave a presentation on an aspect of her research. Caroline is completing a PhD in English at Victoria University. She is using the Dorothy Neal White Collection to research illustration in junior fiction in New Zealand from 1890-1920, and its impact on the formation of a national identity at a time when New Zealand, while still a colony, was establishing its own seminal persona as separate and distinct from Australia. For this talk she concentrated on the work of one author. Entitled “Little Mate” : the representation of women in the work of Mary Grant Bruce she gave us a fascinating view of the how the text of these novels was visualised by the artists who illustrated them. Mary Grant Bruce was born in Victoria, Australia, in 1878. As a child she wrote poetry and short stories, and after completing her matriculation she moved to Melbourne where she worked as an editor and wrote weekly stories for the Leader children’s page. 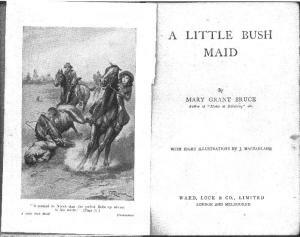 Bruce’s first book A Little Bush Maid, originally a serial, was published in 1910. This was to be followed by 15 more titles in the Billabong series – and in total, between 1910 and 1942 she published 37 children’s novels. In her talk she looked at illustrations of Norah, by J. Macfarlane, in the several books in the Billabong series. At the beginning of the series Norah Linton is 11 years old and living on the Billabong cattle and sheep station in Northern Victoria with her older brother, Jim, and widowed father. Growing up without a mother she has been left to grow “just as the bush wild flowers grow – hardy, unchecked, almost untended”. She lives out of doors, working on the station with her father and brother. She is an excellent horsewoman and “Bobs”, her horse, is a major character in the stories. The books follow Norah’s progress from child to woman – from adventures on the farm (horse racing, battling bush fires, rescuing hermits) through World War One, a trip to London and the courtship of Wally. The illustrations reflect Norah’s feisty nature and her natural kindness, in the surroundings of the Australian outback and later the more sophisticated settings of the city. Those of us who were familiar with Mary Grant Bruce’s work appreciated the opportunity Caroline gave us for a closer examination of the novels – and those of us to whom these stories were new were keen to discover more about Norah and her family. We had no applications for the FDNW Scholarship in 2004 so it was decided that a special “continuation” award be made to Caroline to help her complete her research. A cheque for $250 was presented to her at the end of her lecture – along with the invitation to return with another instalment of her research at a later meeting. The New Zealand Post Book Awards promote excellence in children’s literature and provide recognition for the very best New Zealand books for children and teenagers published each year.The New Zealand Post Book Awards, and the celebrations which surround them, are sponsored by New Zealand Post, supported by Creative New Zealand and Book Tokens (NZ) Ltd., and administered by Booksellers New Zealand. On the afternoon of 19 May an enthusiastic audience attended the awards ceremony 2005, marking the 16th year since the awards began. Once again the event was held in the Legislative Council Chamber and Grand Hall at Parliament Buildings, the venue lending prestige to the occasion. Ginette McDonald, Mistress of Ceremonies, introduced the hostess, the Hon. Judith Tizard, Associate Minister for Arts, Culture and Heritage, who, in warmly welcoming all present to ‘this wonderful event’ spoke of it as a time to celebrate ‘our most talented writers and our wonderful range of children’s books’. She spoke of the enthusiasm and energy of all those involved in producing children’s books, and the way in which books enrich our lives, and concluded by congratulating all those passionately involved in the event. John Allen, CEO of New Zealand Post, sponsor of the awards, spoke enthusiastically of books which capture the hearts and minds of children, referring to several of the award finalists with which he was obviously familiar. Linda Henderson, CEO of Booksellers New Zealand, responsible for the awards and the preceding Festival, followed him. Linda stressed the many advantages of books versus technology and the importance of engaging the young mind in imagery. She thanked both New Zealand Post and the current judges for their commitment. Ginette McDonald then introduced Bob Kerr, convenor of the judging panel. The other judges were Jackie Clarke and Julie Harper. There were 122 entries this year, 56 in the Picture Book category, 20 in the Non Fiction category, 20 in the Young Adult Fiction category and 26 in the Junior Fiction category. From this selection five books were shortlisted in each category and one of these selected as the winner of each. The overall winner, the New Zealand Post Book of the Year, was chosen from the four category winners. This year the Judges announced the winner of the Children’s Choice in each category, leading finally to the overall winner of the Children’s Choice. The Other Ark by Lynley Dodd 37,000 children and young adults voted for this award, a 25% increase on last year. This book won because it did more than carefully explore known territory. It showed us new ways to tell stories, new ways to use pictures, and new ways to mix the words and pictures together. The voice of Lolly Leopold was so real and the world of the Tai Tapu school playground so convincing that we forgot all about the grown-ups with their names on the cover. The precocious Lolly really had written this landmark book”. At the conclusion of the Awards ceremony guests mingled in the Grand Hall with the authors, illustrators and publishers for drinks and canapés. During this pleasant social interlude, we were entertained by the young choir from Rata Street school with a delightful performance, greatly enjoyed by all present. We are absolutely delighted to announce that Kate de Goldi will be joining us on 7 July 2005, after the AGM and SGM, to tell us about the writing of her award-winning book Clubs. With her neighbour, artist Jacqui Colley, and her husband Bruce Foster, Kate has created the deliciously different picture book that wowed the judges at this year’s New Zealand Post Books Awards for Children and Young Adults (for a full report on the Awards’ ceremony see the post awards). Come and hear how they achieved this great result with their first (but we hope not their last) collaborative work. All club members (and their friends) welcome!! We will be asking non-members for a gold coin koha at the door to help with costs. We will miss her involvement with the Society and send our condolences to her family and friends. Below is the obituary for Nancy that was published in the Dominion Post on 5 May 2005. If Nancy Radford had been born a few decades later, as a young woman she would probably have been juggling her family with a demanding executive career. That wasn’t the norm in her time. She looked after her family at home and channelled her excellent intellect and strength into voluntary activities. Mrs Radford, 88, was, though she wouldn’t have considered herself as such, a feminist. For example, she pushed for accommodation in university halls of residence for young women in the early 1960s at a time when they were only just beginning to attend university in any number. She did her masters degree in the early 1930s, when it was still unusual for a woman to aspire to higher education. She majored in the then new subject of geography. She became the women’s vice-president of the Canterbury Students’ Association in 1938. She trained as a teacher then took a job teaching English at Waitaki Girls’ High, where her broad mind got her into trouble. Encouraging her students to read literature outside the square, the paranoia of war-coloured Oamaru opinions created a suspicion she might have been promoting communist ideals. There was a police swoop on the school and her papers and documents were studied and some seized. She left conservative Oamaru not long after and took upa position at Christchurch Technical College. By 1943 she was married and, in common with most women of her generation, however well-educated, she gave up her job. But, encouraged by her husband, whose career was spent in the family retail business, she began a lifetime of energetic and innovative community work. She was a strong worker in many local groups when her children were small, and later took national positions. When she saw a need she was prepared to step in and use her considerable talents to meet it. Mrs Radford was the leader of the Federation of University Women from 1970-73 at the time of its 50th jubilee, when she exhorted women graduates to apply their knowledge and skills to all the problems of public life. It was a subject she was fully qualified to hold opinions on. Mrs Radford attended every International Federation of University Women conference from that in Brisbane in 1965 to that in Christchurch in 1986 and began many enduring friendships as a result. She is described in Winifred MacDonald’s history of the federation as an “excellent president, outgoing, warm-hearted, unruffled”. She was the first woman on the management committee for Barnardos and became national president in the 1980s. She helped to establish New Zealand-focused programmes at the time the parent organisation in London began to allow internationally differentiated ways of work. She continued her interest in Barnardos over many years and attended annual meetings, forums and celebrations for as long as she was able. She was a member of the board of Arohata Women’s Borstal, as it was then called, for six years, one of the first “ordinary citizens” to be appointed. She was also involved with the YWCA in Wellington at the time of the construction of the new building in upper Willis Street. The family recall many of their furnishings and possessions being siphoned off for the new space – including the piano. She was awarded the OBE for services to Barnados and the community in 1985. Andre Norton, who has died aged 93, is nowadays recognised as one of the most popular writers of young adult fantasy and science fiction novels. Her Witch World series, which ran to more than two dozen volumes, was notable for attracting a large female audience at a time when most teenage science fiction was aimed at boys. In Witch World, Simon Tregarth is transported to the planet of that name, via an ancient stone in Cornwall. He finds himself in the land of Estcarp, a matriarchal, semi-feudal society ruled over by witches who derive their powers from mind enhancing jewels. After the first story, involving an alien invasion of Witch World, Norton reduced the more overt science fictional elements and concentrated on relating the adventures of Tregarth, his wife Jaelithe and three children in a sword and sorcery fantasy world. Norton’s novels feature adolescent, independent, often alienated heroes and heroines struggling with their own individuality as they discover more about themselves and the world they live in. These rites of passage are played out against fast-moving quests, with enough action to enthral a teenage audience. 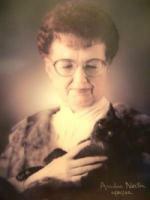 Born Alice Mary Norton in Cleveland, Ohio, she chose Andre Norton as a pen-name at a time when genre fiction was expected to be written by male authors, and changed her name legally in 1934. Andre, she felt, was ambiguous enough to allow her to write for teenage boys, and many were surprised to find that “Mr Norton” turned out to be a slender, brown-haired and green-eyed young woman. Norton was inspired by her creative writing teacher at Collinwood high school, and became editor of the school newspaper, Spotlight. She wrote her first novel in her last year there; some years later, she rewrote and sold it. She graduated in 1930, but the depression forced her to join the staff of the Cleveland public library, while she continued her education with nightclasses in journalism and creative writing at Cleveland College, Western Reserve University. Her first novel for teenagers, The Prince Commands (1934), was a romance in the manner of George Barr McCutcheon’s Graustark novels about a fictional small European monarchy. In 1941, Norton briefly owned a bookshop before taking up government service as a special librarian for a citizenship project in Washington, DC, and at the US Library of Congress. She returned to Cleveland library in 1942 as an assistant in the children’s department. During the war, she became acquainted with the Cleveland Press World Friends Club and was given access to letters from the occupied Netherlands, which inspired three espionage novels, The Sword is Drawn, Sword in Sheath and At Sword’s Point. Her historical novels from this period ranged in subject from colonial Maryland (Follow the Drum, 1942) and pirates in the West Indies (Scarface, 1948) to the American revolution (Yankee Privateer, 1955) and the Apache wars (Stand To Horse, 1956). Forced by ill health to resign her post in 1950, Norton became a reader for the science fiction specialist publisher Gnome Press and editor of science fiction at World Publishing. Her first science fiction novel, Star Man’s Son, 2250AD, appeared in 1952, although she had been a long-time reader of the “space opera” genre. Her subsequent novels – among them Star Rangers, The Stars are Ours, Star Guard, Star Born and Star Gate – form a loose future history, while others (initially published under the pen-name Andrew North) concern the exploits of a tramp space freighter, the Solar Queen, in Sargasso Of Space, Plague Ship and Voodoo Planet. Norton’s most famous series, Witch World (1963), was followed by dozens of other fantasy novels for adults and young adults. She wrote, or co-wrote, some 160 novels in all, of which the Beast Master and Star Ka’at series were also very popular. Her last completed novel, Three Hands Of Scorpio, will appear next month. During her 70-year writing career, Norton accrued many awards, including the Boys’ Clubs of America Medal, the lifetime achievement awards of the World Science Fiction and World Fantasy conventions, the Fritz Leiber and Jules Verne awards and the Nebula Grand Master award. She was enrolled in the Science Fiction and Fantasy Writers’ Hall of Fame in 1996, and the Science Fiction Writers of America recently. Norton was hospitalised with pneumonia last month, but later returned to her home in the Nashville, Tennessee, suburb of Murfreesboro. She had no other immediate surviving family, and asked to be cremated with copies of her first and last books. 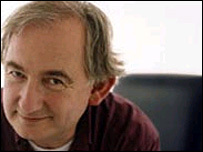 The writer and broadcaster Humphrey Carpenter has died aged 58. Carpenter created the Mr Majeika children’s books, turned into a TV series starring Stanley Baxter. He began his career at BBC Radio Oxford before moving to national radio and was currently presenting the Radio Four series Great Lives. He died suddenly from heart failure at home in Oxford on Tuesday, leaving a wife and two daughters. He also suffered from Parkinson’s disease. Carpenter, the son of a former bishop of Oxford, was a pupil at The Dragon School in Oxford. As well as children’s books, his works included biographies on Tolkien and CS Lewis and the Oxford Companion to Children’s Literature. Describing his hobbies inWho’s Who as sleep and ” exploring decayed railway junctions “, he was also a musician and played the tuba, double bass and bass saxophone. In 1983 he formed a 1930s style jazz band, Vile Bodies, which for many years enjoyed a residency at the Ritz Hotel in London. He also founded the Mushy Pea Theatre Group, a children’s drama group based in Oxford, which premiered his Mr Majeika: The Musical in 1991 and Babes, a musical about Hollywood child stars.